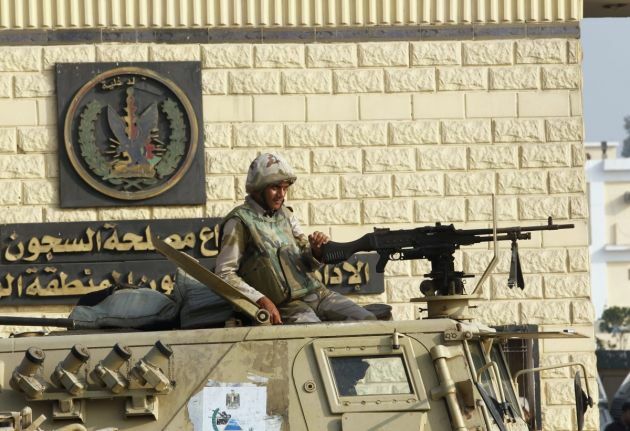 (Photo: REUTERS / Louafi Larbi)An Egyptian army soldier guards on an armoured personnel carrier in front of the main gate of Torah prison where deposed leader Hosni Mubarak is detained in, on the outskirts of Cairo, August 22, 2013. Mubarak could leave prison on Thursday after a court ruling that further divided a country in turmoil since the army toppled Islamist President Mohamed Mursi seven weeks ago. "We need guarantees from the authorities to the Egyptian people: that the gains of the Jan. 25 revolution cannot be violated, especially in the field of freedoms, human rights and freedom of expression," he said. Makhyoun warned against violence and counter-violence at a time when arms have been freely available in neighbouring Libya since the fall of Muammar Gaddafi two years ago. Makhyoun listed that as one of his main concerns, together with the reimposition of the state of emergency, the closure of Islamist TV stations the day Mursi was toppled, and the mobilisation of "thugs" by the state.